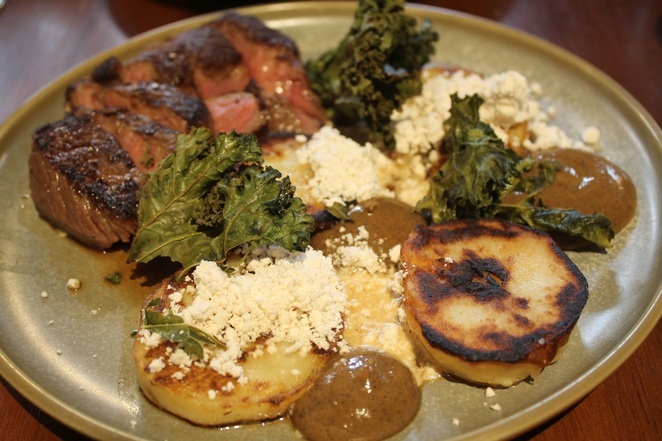 Six Feet Under's rump cap with duck fat potato, burnt onion, crispy kale and jus. Author image. Funeral directors might disagree, but there really is no better place to be than Six Feet Under. 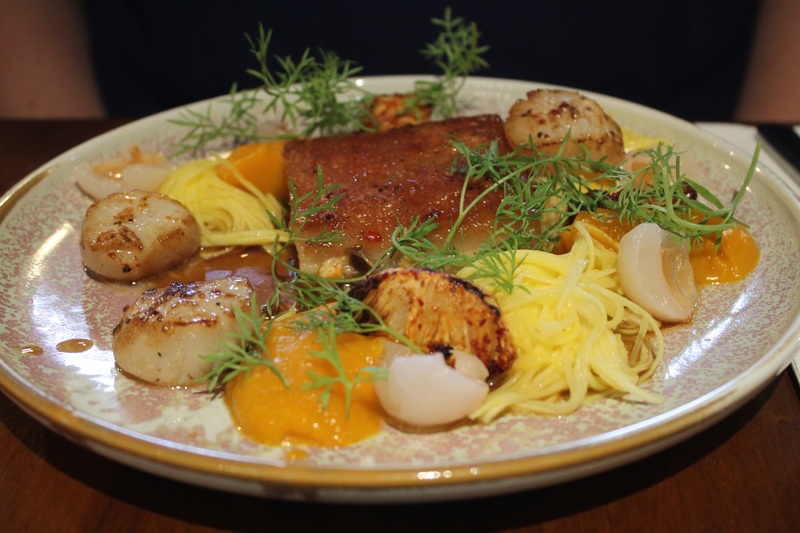 Open to the public for breakfast and lunch, and in the evenings for functions, this basement space in Newstead is (curiously) both spacious and intimate, with an all-day menu that shifts according to the season. My companion and I visited during the last days of summer, to chow down on the surf and turf (pork belly, scallops, pineapple, lychee and green mango) and the rump cap (a juicy cut of steak served with duck fat potatoes, burnt onion, kale and jus). An extensive beverage list is a further bonus. And, when it comes to coffee, the baristas here really know how to make good, strong, hangover-banishing brew. It's an unassuming entrance. Author image. Meal options on the current menu, which straddles breakfast through to lunch, include the delightfully inventive 'chilli scramble' (fermented chilli, spanner crab, kai-lan, bean sprouts, edamame, furikake and sourdough) and a slow cooked lamb shoulder, served with harissa, baba ganoush, green tomato, farro tabouleh and pickles. The sipper cup set isn't overlooked either. Options including bacon and egg muffins, scrambled eggs on toast, and chicken nuggets and fries, are all available at very affordable prices. 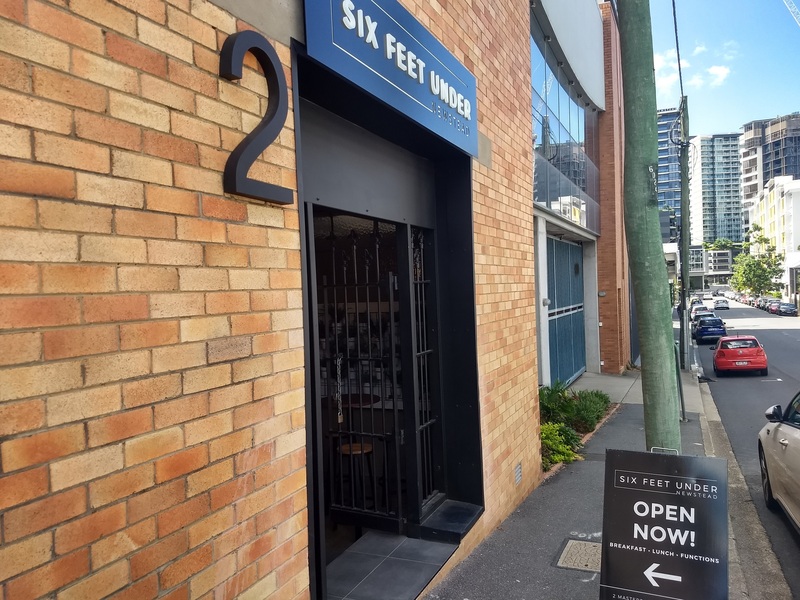 Six Feet Under is a fully indoor venue featuring high ceilings and polished concrete floors along with plenty of timber, steel and black accents. At night, the venue becomes a fabulous 150-seat function space perfect for those who like to host a party. Showcasing the best of what the venue has to offer, Six Feet Under also hosts its own events such as the 80's rewind party. Go there. Go hard. Six Feet Under's signature surf and turf featuring pork belly, scallops, pineapple, lychee, and green mango. Sounds and looks very quirky Damsel.